Located in Pongola Game Reserve, White Elephant Lodge offers a full safari experience. While here you can enjoy morning and afternoon game drives, head out into the bush on foot led by an expert guide, and, due to the proximity of Lake Jozini, take boat trips and go canoeing. Add to this specialist activities such as tracking black rhino and spending time with the lodge's elephant researcher, and a stay here is packed full of activitiy and variety. Between activities you can rest at the lodge, sinking back into a sofa in the lounge or enjoying the superb views from the deck. There's an outdoor infinity pool which comes into its own on hot days. Dining is generally al freso on the wide veranda, and there's a camp fire where guests gather for pre and post dinner drinks. Accommodation is in spacious tents, cooled by ceiling fans, and set on raised platfioms. They have large beds with mosquito nets, Each has a shaded deck to the front with 2 deck chairs. The bathroom. to the rear of the tent, has twin hand basins and a lovely rolltop bathtub with views to the bush, and you'll have the benefit of a sensual outdoor shower. Open: White Elephant Lodge is open all year. Location: The lodge is in the Pongola Reserve which adjoins Lake Jozini. It is at the foot of the Lebombo Mountains. The lodge is 12kms from the entrance gate of the reserve. Gate hours are 06:00 to 18:00 and are strictly enforced. Air access is via the airport at Richards Bay and Mkuze airstrip. Rooms: There are 8 tented suites, all with a private viewing deck, en-suite bathroom with a freestanding bath, twin hand basins, bathrobes and a canvas-screened outdoor shower. They are cooled by ceiling fans and beds have mosquito nets. All tents are equipped with a minibar and tea and coffee makers. Activities: The lodge offers a blend of morning and afternoon game drives, boat trips on Lake Jozini, canoeing, guided bush walks, bird watching and fishing. 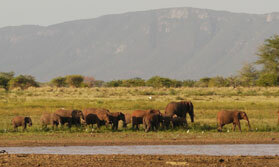 Specialist activities include black rhino tracking and accompanying an elephant researcher on daily activities. Facilities: The large, high-ceilinged lounge has deep armchairs and sofas, a selection of reference books. Wildlife prints decorate the walls. The campfire is the scene for pre-dinner dinks. There is a swimming pool. Dining: Meals are usually served outdoors on the veranda, weather permitting, though there is a dining room for use on cool or inclement evenings. Children: Children aged 12 years and over are welcome, unless the lodge is booked for exclusive use when exceptions may be made. The minimum age for bush walks and rhino tracking is 16 years. Communication: There is Wi-Fi but it is unreliable. "If you're looking for somewhere friendly and welcoming to stay on safari, where the main house feels a bit like being in someone's home, this is a good choice. I'd say the tented rooms are comfortable rather than luxurious, despite the 5 star classification.We had very good sightings on our well-guided boat cruise on the Jozini Dam, including rhinos, lots of elephants, zebras, waterbuck and impalas. They have no lions here, which might make a difference to some, but certainly we felt we'd had an excellent safari. There is also a lot of choice of activities here, both in the reserve and nearby. All in all, certainly a lodge to consider in KZN, and I'd happily return here. "